South African sport has seldom sat so close, for so long, to greatness as it does now. Only an inspired rewriting of history by England's batsmen will prevent them from becoming the No. 1 team in Test cricket. It is an accolade that few will argue is not deserved. Besides dominating all but two days of the series against England - the first day at The Oval and the day Kevin Pietersen tore the attack apart - South Africa's ascendancy has been gradual. Their summiting has been a long time coming and having inched towards the top only to be thrown back on too many occasions to count, the build-up to their rise has been immense. Calling it the country's biggest sporting achievement would not be too far off the mark. The 1995 Rugby World Cup was over in a few weeks and victory wrapped up in nationwide euphoria. The subsequent World Cup win in 2007 has resonated as loudly, if not louder, but the 2011 quarterfinal exit stung hard. The 1996 Africa Cup of Nations was similar: too close to democracy for its memories to stick out in isolation and too fleeting for it to leave a lasting effect. Given the performance of the national football team over the years, it is probably the trophy that gets forgotten about first. Olympic have come: Elana Meyer's silver medal, Josia Thugwane's gold, the recent haul in London which nobody had expected to be as good as it ended up being. These memories are only brought out once every four years though. Golf majors have come, as recently as Ernie Els in the Open but they have all come in the shadow of Tiger Woods. Cricket is the country's third most popular sport and it is not the most demographically representative. It sits between rugby, considered the game of the elite with internationals only broadcast on pay television and football, played by the people but often of sub-standard quality as a whole and has recently started to find its place in the wider context of South African society. Cricket is a well-represented schools sport, it piques the interest of people of all races and both genders and its development arms has grown. In some ways, it the perfect balancer and the national team's progress has been tracked with a close eye. Too close sometimes, like on the eve of a World Cup or after a Test match is lost. On their departure to England, that eye was trained on them in finer focus than usual because years of being patient in waiting for them to achieve major success had come to an end. Sports minister Fikile Mbalula, who does not usually attend cricket events, sent them off with an instruction to "break hearts in the Queen's Land". Expectation has always hung over South Africa, as a lace veil, as a cotton sheet and this time as a velvet curtain: heavy, thick and dripping with possibility. South Africa have taken charge, where before they may have sat back and waited for things to happen and that could prove a sign of the greatness that has eluded them until now. Gary Kirsten's new coaching style, which hinges on unorthodox methods, was to be tested in its most rigorous way. Allan Donald's aggressive approach to bowling was going to see his charges come up against the one pack in the world that people believed would match them. Graeme Smith's captaincy would face its most stringent examination. Jacques Kallis would be on his last tour to England, along with several other players because of the future schedule which does not see South Africa back in England for four years. What added to the hype is that South Africa would have the chance to take the No.1 ranking off the No.1 side and in so doing, earn a title many have felt they have deserved. In this match, they have had to earn it. England have had South Africa in tight spots - at 54 for 4 while they were batting, at 221for 5 when England were batting and at 282 for 7 when South Africa were setting up the target. Every time, South Africa have found a way out. A lot of the time, that way has been through Vernon Philander. His 61 in the first innings and 35 in the second were definitive bricks in South Africa's wall of authority. He showed himself as the all-rounder his performances at lower levels of cricket have always labeled him. More than just a bowler who can bludgeon or a seamer who can sustain an end, Philander showed real skill and composure. For the first 14 balls of his second innings, Philander was content to defend. After 24 balls, he had only scored two runs. Then, he outside edged Stuart Broad for some lucky runs but followed it up with a shot that spoke of his ability. A small shuffle forward, a glance down the ground, connection that was well-made and timing that was spot on and Philander had taken South Africa over 300. By the time he was dismissed, 39 balls later, after playing a shot that so disgusted him he stood at the crease for several seconds waiting to be woken up from his nightmare, South Africa lead by 330. With Philander being the unlikely batting hero, JP's Duminy quiet contributions may be forgotten but they could be ones that see him force his way into the XI ahead of Jacques Rudolph when the specialist wicketkeeper is selected. Duminy acted as the chauffeur to the tail, a role he has not played in the past but that he has shown he is able to do now. Like all the South African batsmen, runs did not come easily for him, neither did they come beautifully. They had to be fought for in all their tough ugliness. The singles had to be scored as though batting in a dusty, construction site with dirt needing to be wiped form eyes and smudged across cheeks just to get the job done. The boundaries came with such rarity that when they did they were either bulldozed for the sheer joy of seeing a full toss or a short and wide ball or squirted, in dangerously flammable fashion to third man. But even batting between the razor wire could not stop South Africa. They got there. They reached a total that would require England to score their highest fourth innings total in pursuit of victory and they dented any hopes of that with Philander's double strike in the final hour. For a man who has had a quiet series so far, he roared with a spell so destructive, the scent of rubber burning off it could almost be detected. 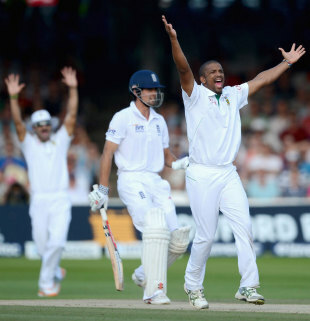 Alistair Cook and Andrew Strauss were both victims of Philander's skill and their own uncertainty. Their dismissals will add to South Africa's certainty. The certainty that a history that has been in the making for years is finally just a day away from being written and the certainty that they do not need that history to write itself. South Africa have shown, in this series, that are able of creating things for themselves. They have opened up a batting line-up that was once as tightly packed as terrace houses and made an attack that was talked about as the best in the world look ordinary, bar a few Steven Finn moments. They have taken charge, where before they may have sat back and waited for things to happen and that could prove a sign of the greatness that has eluded them until now.